At 9stacks, we have designed our loyalty program “StackUp” to be simple to use and genuinely beneficial to you. For every 10 Rupees of rake that you generate (Net of GST), you will earn 1 StackUp point. All StackUp points can be redeemed for an equal number of chips in your Poker Balance. In addition, As you earn more StackUp points, you will move up to Silver/Gold etc as described below. When you sign up on 9stacks.com, you are automatically enrolled in the StackUp program. Our system automatically calculates your earned StackUp points as you play or refer friends; you don’t need to do anything special. As you gain StackUp points you’ll move up from Blue through 6 tiers: Bronze, Silver, Gold, Platinum, Uranium and… wait for it... Kryptonite! Each tier in turn has multiple levels within it. You start with zero StackUp points when you sign up with 9stacks. Your default Level is 1 and Tier is Blue. You will be upgraded to the Bronze Tier when you earn 9 StackUp points. This tier comprises of 4 levels of 50 StackUp points each. So, for example, when you earn your 60th StackUp point, you’ll reach Tier-Bronze + Level-3, and so on. Once you cross Level-5, you are upgraded to the Silver Tier, which comprises 9 levels. 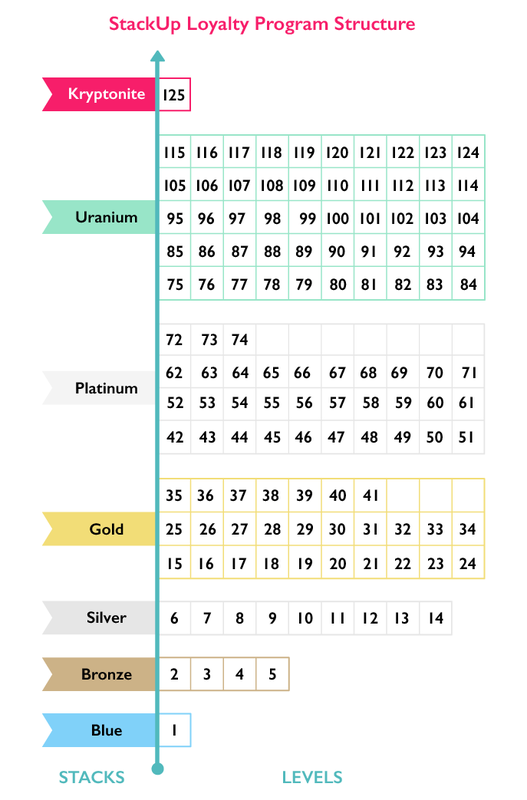 Once you reach Level-15, you are upgraded to the Gold Tier, which comprises 27 levels. Once you reach Level-42, you are upgraded to the Platinum Tier, which comprises 33 levels. Once you reach Level-75, you are upgraded to the Uranium Tier, which comprises 50 levels. Once you cross Level-125, you are upgraded to the top – you’re Kryptonite! A true legend!